Uroplatus phantasticus are one of the smallest species within the genus Uroplatus. 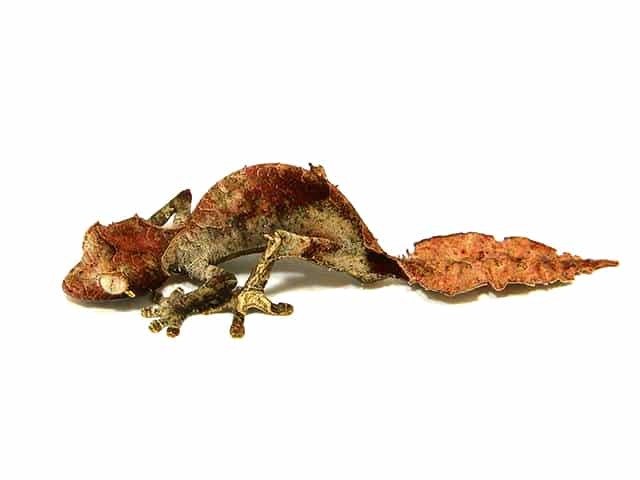 Being in the Genus Uroplatus, Phantasticus have evolved to mimic leaves. Their tails have the shape, coloration, veins, notching, and lichen commonly found in their natural environment. Uroplatus phantasticus have evolved to mimic dead or dying plant matter instead of branches and living vegetation. Their unique appearance and size have made them one of the most desired gecko species available. There is more than one correct way to house your Phantasticus, but there are a few requirements to ensure your geckos’ needs are met. Like other species in the Genus, Phantasticus are predominantly an arboreal species. We suggest using vertical enclosures that still provide adequate substrate exposure. We have had the best success with 0.3 x 0.3 x 0.45 meters (0.9 x 0.9 x 1.5 feet) or 0.45 x 0.45 x 0.6 meters (1.5 x 1.5 x 2 feet) glass enclosures (depending on age/size of the pairs being housed with most being housed in the 0.3 x 0.3 x 0.45 meters). Unlike most others in the Genus, Phantasticus have evolved to mimic dead or dropped leaves instead of branches and live plant matter. For this reason I cannot stress enough how important the development and enrichment in the bottom 1/3 of the enclosure is for this species. There are 3 ways of planting a U. phantasticus enclosure: real, artificial, or a combination of both. Although there isn’t a wrong way, the least preferred is the exclusive use of artificial plants. Artificial plants provide cover and enrichment but they do not help with humidity or air quality within the enclosure. When selecting plants for the enclosure, you have to first determine what is safe and best for the Phantasticus. I have found a combination of Pothos and Ficus to be the best options. These plants are hardy, strong enough to support movement, safe for the geckos, help retain humidity, and are easily obtained. Never choose a plant species which may be toxic if ingested, even though Phantasticus are not herbivores. Most plants will have pesticide residue on their leaves and should be washed thoroughly prior to being placed within the enclosure. When selecting your plants, look for healthy plants free of insects or fungus. The use of artificial plants should only be used to fill in some of the dead space and additional enrichment throughout the enclosure. The last component of cage décor is the branches and sticks. These help allow access and mobility throughout the entire enclosure. When selecting branches for your enclosure, you want to first begin by ensuring that they are free of parasites or other organisms that you do not want to introduce into the enclosure. Whether you are purchasing or collecting branches, thoroughly clean and inspect them to prevent any introduction of unwanted foreign matter. There are many techniques for cleaning the branches, and all are relatively equal in effectiveness. Make sure any residues from cleaning agents are removed prior to placement within the enclosure (as the geckos may drink droplets formed on the branches). The diameter of the branches should be 1/2″-5/8″ or roughly the width of the gecko. The use of commercially available flexible vines is not necessary, but may be ideal for filling in the top 1/3 area of the cage to allow for full mobility of the enclosure. Uroplatus phantasticus will not utilize a hide box but should be provide with plenty of hiding places. The use of real and artificial plants as well as leaf litter will generally suffice for hiding places. Occasionally the crossing point of branches creates a desired hiding place as well. If your enclosure is developed as suggested then a hide box or additional hiding places will not be necessary. There are many options when it comes to substrate and a few factors to consider when choosing an appropriate substrate. The most important factor is the ability for the substrate to retain moisture (helps maintain humidity). Certain substrates can also be utilized by living plants within the enclosure (live plants are not necessary, but highly suggested). Most females will dig shallow holes while nesting. Ensuring your substrate allows for safe nesting will help encourage females to reproduce. Lastly, does the substrate allow for feeders to bury or hide too easily? This tends to be more of an issue when using various mosses as your primary substrate media. There are several commercially available options such as Sphagnum Moss, Peat Moss, Coco coir, Bed-A-Beast, ABG (or similar mixes), etc. Although none of these are immediately better than the other, I do prefer an ABG style substrate to the others. That being said, as long as your substrate complies with the above listed factors, that would be sufficient. On top of the substrate should be a layer of leaf litter. U. phantasticus do spend portions of their nights prowling through the leaves and often utilize them as shelter for nesting sites. I have found a disbursement of leaf litter on roughly 1/2 the floor space to be an adequate coverage without providing too much cover for feeders to hide. Coming from the montane forest of Madagascar, U. phantasticus prefer cooler temperatures with high humidity. These temperatures range from 21-24°C (70-75°F) during the day and a night temp between 20-22°C (68-72°F) during summer months. I do not recommend cooling Phantasticus, but I do allow our temperatures to drop 1 °C (2-3°F) during the Winter months with gradual warming periods in Spring and cooling periods in Fall. Temperatures below 18°C (65°F) and above 26.6°C (80°F) are not safe and should be avoided, even for short durations. With such a small window of optimal temperatures and need of cooler temperatures, I do not recommend a basking light for this species. The use of UV lighting is something that is always up for debate and valid points are made from both sides. I use full spectrum lighting for the live plants within the enclosures, which also serve as the lighting for the room. Although I use UV lighting, I wouldn’t say UV lighting is necessary for U. phantasticus. Lighting is still beneficial in simulating photoperiods (the length of daylight based on season) and meeting the plant requirements. Even with lighting, the use of supplements should remain a constant for your care. Uroplatus phantasticus drink by lapping water droplets on plants or on enclosure walls. Whether manually misting with a pump mister or utilizing an automatic misting system, such as Habba Mist, you want to ensure the development of standing droplets occurs. There are many opinions and views on whether to us RO, distilled, filtered, etc. and all of which make valid points. However, the water quality and components varies greatly and no one method is ideal for everyone. I personally have success with using a water filter and then adding additional dechlorination drops. The water is maintained at room temperature or slightly above. If the water is too warm or too cold you will often see the geckos flee when being misted rather than drinking the droplets. The frequency at which you are misting will also be relative to your method for obtaining adequate humidity. By misting primarily at dusk and early evening you will ensure that the geckos have available droplets during their most active times. Misting during the day should be used to maintain humidity, but is not appropriate for drinking opportunity. Humidity should be maintained between 70-85% year round. I have found that a slight drying out of the enclosure (60-70% humidity) during late afternoon with a heavy mist/rain (85% humidity) as lights go out to be the most effective. You want to maintain adequate air exchange while maintaining humidity to help prevent mold and stagnant air from accumulating. Be sure not to mistake enclosure humidity with an enclosure being saturated. When it comes to feeding your U. phantasticus, there is not a specific feeder that is the “best” option. In general, I feed a combination of adequately sized crickets, roaches, and a constant supply of isopods are kept within the enclosure. Adults generally feed on 1/2″ crickets, adult Lateralis, and juvenile Dubia. Babies are generally offered Lateralis and Dubia nymphs and 1/8″-1/4″ crickets. The general rule for appropriate sizing is no larger than the width of the geckos’ neck. A large majority of U. phantasticus take to dish feeding relatively well, as long as there is a contrast between the dark feeder and the dish they are in. I have had great success using white disposable worm dishes. The lip reduces the number of feeders escaping the dish. How much should you be feeding them? I prefer to grow my Phantasticus slow and keep them lean. I have found that growing them too fast and keeping them “fat and happy” resulted in a significant decrease in fertility and annual clutch counts. I do not follow a feeding regimen but instead feed each enclosure as needed. Supplying enough feeders to last 2-3 days and allowing the absence of feeders for a period of 1-2 days has proven to be a good routine for maintaining healthy weight and supporting a steady growth. The only deviation is the first 2 weeks after a female lays a clutch. During this time, I will feed daily with only 3-4 feeders. This helps ensure the females are getting adequate supplementation during their breeding season. Babies follow a similar feeding regimen with reduced numbers of feeders offered each feeding based on consumption rate. Supplementation is essential for Uroplatus phantasticus in captive care. Over the years, I have tried numerous supplements and combinations of them in search for the most effective. A mixture of Sticky Tongues Miner-All, Repashy Calcium +, and Bee pollen powder in a ratio of 4:1:0.25 respectively has worked wonders for my U. phantasticus. Although this is one of the many options, this blend has produced great reproduction and developmental results for me over multiple seasons. The feeders should be dusted every feeding (if using the method stated above) unless you are feeding more than 3 times a week, at which point a 2-3 dustings a week is sufficient. In addition to supplementing with topical powders, a feeder gutload is highly recommended. The point behind gut loading is simply to ensure the feeders are as healthy as possible and contain higher vitamin and mineral content than a grain based diet. Dark leafy greens, fruit, vegetables, and whole grains are all good feeder options. There are some commercially available options, but they should be used in conjunction with fresh vegetables and fruits. Although they are an amazing species and the tiny babies are cute, do not unnecessarily agitate them. Do your best to refrain from holding or disturbing them as much as possible. Uroplatus tend to defecate on the walls of the enclosure or on plant matter. Every week I go through and clean the cage using only water. During the cleaning all feces and any other unwanted materials are removed and walls of enclosure are wiped down. However, I go through every enclosure 2 times a year and clean all components and decoration and replace substrate (about 75% exchange of substrate). All of our enclosures are bioactive so no cleaning chemicals are used for our enclosures. Keeping as hands free from this species is something I can not stress enough. Shedding is a relatively common issue faced with this species. This is primarily due to the lack of adequate humidity. If you abide by the suggested humidity above, you will likely never have issues. However, in the instance that you do encounter shedding problems, don’t delay in assisting the gecko. Once a shedding problem is identified (more than 24 hours of failure to complete a shed) I begin by heavy misting the enclosure. This usually increases the humidity enough to soften the stuck shed. Carefully grasping the gecko you can assist with a q-tip rubbing the skin from snout to vent. The arms and legs should be dealt with extreme caution as their limbs are fragile and can be injured or pulled from socket easily. For stuck shed on the feet, I find the best method to use your fingers to pinch the stuck skin from the palm and pull towards the toes. The skin on the palm is slightly thicker and less likely to break which helps ensure the pads are free and clear of skin, thus allowing for climbing and normal activity. If you do have a shedding issue be sure to check humidity throughout the day and adjust your husbandry as needed to help ensure your gecko can shed appropriately. One of the most common problems I see with raising Phantasticus is keeping them too wet or too dry. Either extreme is counterproductive and detrimental for the gecko. Animals with excessive air flow usually have shed issues and failed to thrive. Misting with water that is too cold will often shock the animals and increase their stress levels. Adequate supplementation is an easily avoidable variable and should be done with every feeding.